It was in the 1960’s – during my training at the Minerva Art Academy in Groningen – that I walked into a recently restored medieval church. It was the St. Peter and St. Paul Church in Loppersum, five kilometres from Westeremden where I live. The atmosphere inside the church was a revelation to me: the whitewashed walls with coloured accents on the vaults, ribs and pillars, the wall paintings or remnants thereof, and the floors. Each detail told its own story and the various elements together formed a very special ambience. In the 17th century this was especially understood by Dutch painters. 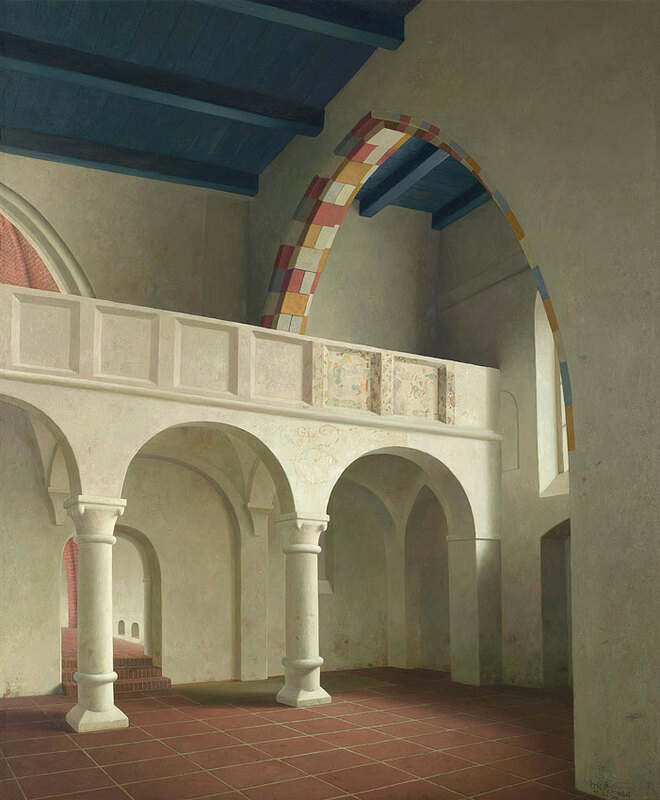 Pieter Saenredam became famous for his church interiors. But there were others, like Emanuel de Witte, Isaäk van Nickelen and Hendrik van der Vliet. In the 19th century there were again painters who chose church interiors in a more romantic setting as their theme. The name of Johannes Bosboom is the first to come to mind. My interest in church interiors is two sided. It has to do with the mentioned atmosphere that fills these buildings, but it is also important to me that these are structures intended for worship. You could call it spiritual architecture. People who know something of art history think that I was influenced by Saenredam. However, I like to formulate this somewhat differently: we are both struck in a similar way by church interiors with a Protestant character, i.e., with many bare walls and open spaces with a piece of furniture or a chandelier here and there. This is what I underwent most intensely when I entered the St. Peter Church in Utrecht for the very first time. It was around 1970. I thought: this is Saenredam! In the region of my birthplace in the Dutch northern province of Groningen, the Groningse Hogeland, we are blessed with an enormous wealth of very beautiful village churches, mostly from the 12th, 13th or 14th century. That has meant that I could find my motifs nearby. But soon I began to undertake journeys to other places that inspired me, like the cities of Utrecht, Breda, Haarlem, Zutphen and Bolsward. Only much later I travelled abroad, especially to France and Germany. It always has been Romanesque architecture that has intrigued me most. Rounded arches are to me without rival; the pointed arches needed not have been invented! That’s why Cistercian architecture entered my life as a very welcome addition to the buildings I encountered in my first twenty years as a painter. The Le Thoronet Abbey in Provence in France is the most beautiful example for me. In the churches I make drawings that contain all that information I need to make them into paintings. I always like to choose spots with light streaming down from a high window and areas of shadow and half shade around it. Besides the large city churches I am struck as much, if not more, by much smaller village churches that have a monumental quality about them as well, like those in Bozum (Friesland), Leermens or Oldenzijl (both in Groningen). Special details can result in very beautiful compositions. Working on church interiors has a sacred quality. You also need a good dose of endurance to see it through and stay inspired. It is a theme that has only been picked up by a few artists. In modern art it does not occur at all, as far as I know. Be that as it may, once you have come within its grip, fortunately you will always want to stay with it.